Some of you may have access to pristine dark skies. But like many, I live in a suburban neighborhood close to a major city dealing with light pollution. The loss of night hits home. But fear not, intrepid observer, I am about to arm you with the tools you will need to appreciate what our sky has to offer. And to our great fortune, Wednesday is the new moon, offering us a once-a-month opportunity to fully embrace the majesty of the night. Shortly following sunset on Wednesday, cast your gaze to the west. Near the horizon is the planet Mars in the constellation Taurus, the bull. Turn 180 degrees towards the east and you will see Jupiter rising in the constellation Virgo, the virgin. These are half of the planetary team visible to the unaided eye. Shortly before sunrise, you can catch Jupiter setting while being pursued by Saturn just west of Sagittarius and at its midpoint in the sky. The great ringed planet is trailed by a rising Venus that appears just tucked under the fin of Pisces the fish. Get those observations under your belt and you’ve officially observed half of our solar system’s planets. 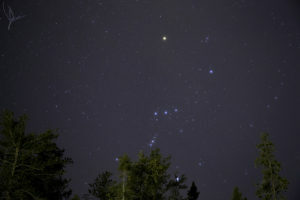 Moving deeper into the sky, and still with an unaided eye, we have the constellation Orion, the hunter. He sits southwest in the sky, low on the horizon and just left of Mars. This famous figure is identified by its distinctive row of stars that makes up his belt. Just below the left most star in the belt is a series of stars running perpendicular that make up his sword. Contained in this group is a blurry patch of sky called the Orion Nebula. Congratulations, you are looking at the birthplace of stars known as a stellar nursery. Hydrogen and other gasses swirl around in this cloud condensing and collapsing due to strong gravitational forces. The high temperatures of this interaction yield nuclear fusion reactions creating the first formations of stellar life, protostars. Higher in the night sky and closer to zenith sits the Beehive Cluster in the constellation Cancer, the crab. The opposite of a stellar nursery, the stars that make up this open cluster are hundreds of millions of years old and numbering upwards of one thousand. The vast majority of the stars that compose this cluster are dwarf size stellar objects while one-third are stars similar in size and brightness to our own sun. The Beehive was first discovered by the Greek writer and astronomer Ptolemy in the second century and later cataloged as one of the first telescopic observations of Galileo. It is bright and distinguishable objects such as these that astronomers use to learn the night sky and how to navigate the stars. However, we as humans aren’t the only ones to map the heavens in order to find our way about the world. Scientific research2 on avian habits has proven that at a young age birds store to memory the orientation of our sun and the stars for navigation and migration. This is just yet another reason why it is so important to preserve our night sky and to help educate others on the need for appropriate lighting not only in our towns and cities but also closer to home. You can increase your ability to observe the wonders of the universe while aiding the native and migratory bird population by turning off any unnecessary outdoor lights. For the lights you need to keep on, you can be a dark sky champion by making sure they comply with proper lighting protocol. Information on good outdoor lighting can be found on our Lighting Basics Page. Be sure to check in next week when we will talk about another famous cluster of the night sky, the difference between constellations and asterisms and the Aquariids meteor shower.